8/6/10 – Acquisition – Geneva, Musée d’Art et d’Histoire – Last 2 June the Swiss museum made the final bid at a Sotheby’s auction in London for a painting by Camille Corot, Young Girl at the Fountain  (ill.), for £ 1,609,250. The painting had formed part of the collections at the Kröller-Müller Museum in Otterlo, before being restituted in 2008 to the heirs of the previous owner, Georg Eduard Behrens from whom the work had been stolen during World War II. 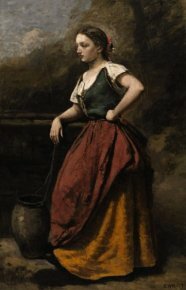 Feminine figures often appear in the artist’s painting, particularly starting in the 1860’s, the decade attributed to the canvas which does not have an exact date . This young woman at a well, though painted in a Realistic manner, reveals at the same time a Classical influence : Paul Lang, the fine arts curator at the Geneva museum, quite rightly evokes  Poussin’s figures, especially those of Eliezer and Rebecca at the Louvre (ill. 2). The painting conveys the artist’s nostalgic remembrance of Italy, which shaped Corot’s art for many years and to which he had not returned since his last trip in 1843. It will join the other fourteen canvases by the artist already in Geneva and will be presented in the exhibition Corot en Suisse which will be held at the Musée Rath from 24 September 2010 to 9 January 2011. The information was provided in Le Temps (Laurent Wolf, “Le MAH de Genève achète un Corot chez Sotheby’s”, 3 June 2010). The Sotheby’s entry dates the painting as around 1863. We point out however that in the catalogue, Hommage à Corot of 1875, it was quoted as being produced in 1857.